The pictured geomorphic landform is one of several Pleistocene paired terraces above the Agua Fria River located just north and west of Phoenix. With a large watershed to the north, the Agua Fria has brought a variety of rock types to the area, forming the river terraces. Sediments on this terrace consist of brown to reddish brown gravelly loam with subrounded structure composed of 50 percent cobbles and gravels. The lowest part of the soil horizon on this upper terrace has soft lime pockets derived from the underlying eroded and indurated calcic surface. 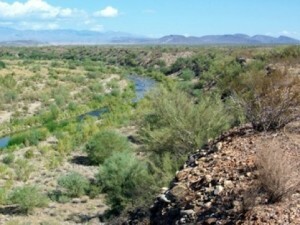 After the subsequent incision of this late Pleistocene terrace, three late Holocene terraces were deposited on the inside of the meander bend on the west side of the river, while the cut bank on the east side of the river exhibits approximately 40 feet of incision attesting to the former power of the Agua Fria River. Sandy sediments on the three lower Holocene terraces become coarser toward the river, reflecting the transport power of the river closer to the former active channel. Typical of most paired terraces, these landforms become progressively younger towards the floodplain. Higher and older terraces, such as the one in the photograph have been available for human occupation for a longer period of time; thus, the potential for long term occupation on the younger terraces becomes less.